I’m so thrilled to be moving this weekend! We really feel that this home is going to be our forever home. We put so much thought and consideration into the design and are so thrilled with the finishes our designer guided us to. There’s no doubt in my mind that she pushed us a bit out of our comfort zone but the end result is really beautiful and something we will love for a long time. So here’s my little packing hack. Yes! Y’all I use it for so many things. When I pack up my utensils I wrap a group of them in the sticky stuff so they aren’t loosely moving around in the box. I also wrap items without a top like cute baskets that hold papers or smaller items. And kids toys! Check out this puzzle that will come right out of the packing box the way it goes in. No lost puzzle pieces during this move! Friends, I want to share with you some of my favorite vegan resources. These are individuals or pages that I have learned a lot from in my journey to veganism. One individual that had the largest impact on my knowledge and commitment to veganism is Colleen Patrick-Goudreau. She is the incredibly articulate and passionate about veganism and animal rights and uses multiple platforms to share the information. Her website is https://www.colleenpatrickgoudreau.com/ . If you would like additional information on veganism and animal rights I encourage you to begin there. Colleen offers a thorough 30 Day Vegan Challenge program, podcasts, recipes, videos and more. A site that I really love is Engine2 at http://engine2diet.com/. They refer to their diet as Plant Strong but it a diet that excludes all animal products. They also have a great newsletter where they share recipes. I encourage you to sign up for it to enhance your vegan recipe collection. One of my absolute favorite food blogs is OhSheGlows.com. Her site is easy to navigate and her recipes are well tested and delicious. You will find some unique ingredients you may not have in your pantry but overall its a home run in my book! She also offers an app for specially curated recipes as well as multiple cookbooks. A great site that really offers a lot of help with meal preparation for the week and also includes a FREE shopping list in PDF is OhMyVeggies.com. Choose from the vegetarian or vegan list and a full week of meals with instructions and shopping guide is available to you to print. Its amazing! I did find that for my family with young children we would have plenty of leftovers each night so I would use one weeks grocery list for two weeks of dinners. Just use the recipes that require the most produce first so that it doesn’t go to waste. Pinterest is a great resource for recipes! I have a vegan board there that I frequently reference for dinner ideas when doing my meal prep for the week. Please share with my any of your favorite resources as well! I love to keep learning and growing! Tofu and all it’s glory! My 3.5 year old loves tofu. You, too, can love tofu. Honest. Tofu is a soy based product that comes in a number of different textures. You will find Silken, Soft, Firm, and Extra Firm varieties. There is also a sprouted variety but I find that less common in my shopping excursions. 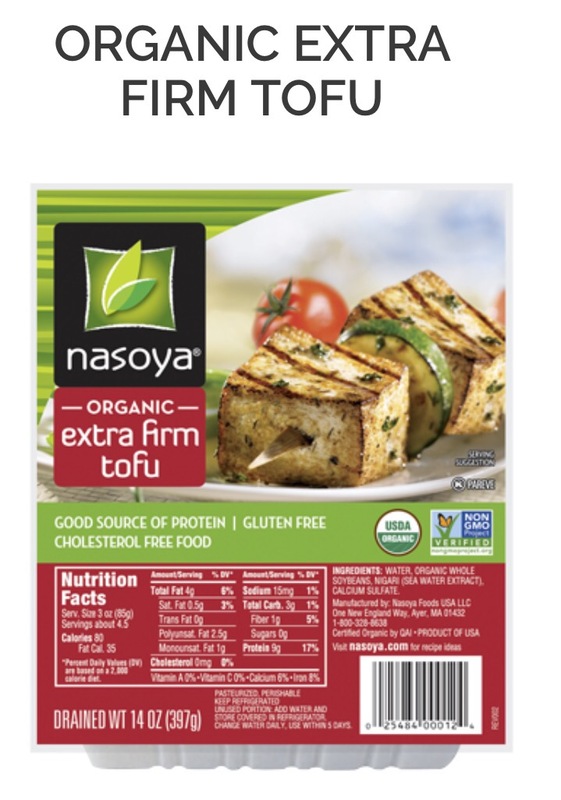 Tofu is typically found in the produce section of the grocery store but may sometimes be found in vacpacks in non-refrigerated areas depending on your grocery store. In grocery stores like Walmart, Target, or Albertsons look in the produce section first. More specialty stores such as health food stores are often more likely to carry the vacpack tofu. So which type to buy? Most often I buy firm or extra firm. I don’t notice much of a difference between the two for my everyday preparation so whatever is there is fine with me. Silken or soft tofu is best for baking or savory dishes when the tofu is blended to make a cake or quiche. Sprouted refers to the state of the soybeans when the tofu was processed. Again, it’s less common in the stores but want you to be aware of the difference. This is my go to brand – so look for this or something similar in your produce section. Don’t be surprised when you open the container that it’s packed in water. Just drain that and begin your preparation. If you don’t cook the whole block, store it in the refrigerator in water but use it within a few days. Tofu’s nutritional punch includes protein, calcium and iron. At just under 100 calories per half cup and 9 grams of protein for that amount it’s surely a main part of a lot of plant based meals. Bake it – slice it into 4 smaller bricks and lay on a greased cookie sheet. Bake for 45 minutes at 350 turning once. Sautée it – cube the tofu and throw in a hot skillet with a bit of olive oil. Allow to brown on each side. So the real point here is if you have had it once and didn’t care for it because of the texture, I encourage you to try another preparation! One really awesome thing about tofu is it acts like a sponge for marinades. To infuse some flavor before your preparation of choice, take the tofu out of the container and press it. This doesn’t require fancy kitchen gadgets, just place the tofu on a few paper towels, put a flat plate on top and and squeeze the excess water out a bit. Then slice or cube your tofu and marinate it in your favorite marinate. Then prepare it in any of the ways listed above. Super flavorful tofu coming your way! Y’all I adore Angela from OhSheGlows.com. She offers amazing recipes for every meal of the day. I linked here a tofu recipe page for y’all to visit. She also offers an app if you want access to exclusive content right in your phone! I hope this tofu primer has demystified this wonderful food for you! Happy cooking! So what do y’all you need in your pantry and refrigerator to begin this vegan journey? Likely not much more than you have already if you are eating a well balanced diet that alread includes fruits and vegetables. The grocery stores, restaurants, and mainstream media are all hopping on board the vegan and vegetarian train and showcasing meatless Monday ideas and as a result items are becoming more available at a local level. I do all of the family grocery shopping between Walmart and Costco and between those two places I am able to stock up on everything I need for my week. Tofu – there are so many ways to prepare it! I’ll share many of my favorites with you soon! Vegan patties – super easy to heat for a quick lunch with veggies. Morningstar brand is very common and makes both vegan and vegetarian food products – just be sure you know what you are buying if you want to commit duly to a vegan diet. Beans – y’all the variety is amazing! I always have canned beans on hand. Dry beans are super cheap and easy to throw in a crock pot as well. Fruit – we go through so much fruit each week! So full of vitamins and nutrients. Vegetables – think outside your regular variety of carrot, cucumber and lettuce! Or try one of the many varieties of those three that are super flavorful as well. Soy yogurt – I have found that the taste and texture of the Silk brand yogurt alternative is the most reminiscent of traditional yogurt that I remember. A nut milk or soy milk. One tip : if you are looking to add protein to your day go with the unsweetened soy milk for the extra protein without the extra calories of a sweetened or flavored soy. Those can add up quickly. The nut mills are great substitutes as well but not as high in protein. Try a few and see what your new favorite is. Vegan specialty products like faux sausages, vegan cheesy popcorn etc. With these simple pantry and refrigerator staples you can tackle your vegan meal prep with ease. For sure there are a lot of specialty vegan products like nutritional yeast that packs a cheesy flavor and is high in B vitamins but I’ll try to point you to healthful recipes that you likely have all the ingredients for right at home already! So don’t feel like you have to only shop or specialty grocery stores or buy a lot of vegan food. Vegan food is really food that we all already eat – it’s the fruits and vegetables we know and love!